In the early nineties, little was known about macular degeneration and there was limited interest in supporting research on AMD and retinal diseases, despite their growing prevalence. Now, much more is known, thanks in large part to our work. Important discoveries have been made in vision research and our funding is focused on the most promising frontiers. More than $24,000,000 dollars have been granted to leading vision scientists performing cutting-edge research. 187 grants have been awarded by MVRF over the past 20 years. 13 international research conferences attended by world-renowned vision researchers from all over the world were convened and hosted by MVRF. MVRF’s SupportSightSM Program has impacted more than 210,000 people through patient education, disease awareness, and outreach. More than 15,000,000 people in the U.S. suffer a form of macular degeneration. Macula Vision Research Foundation (MVRF) is proud to share the results of a clinical trial that has restored sight to its participants. 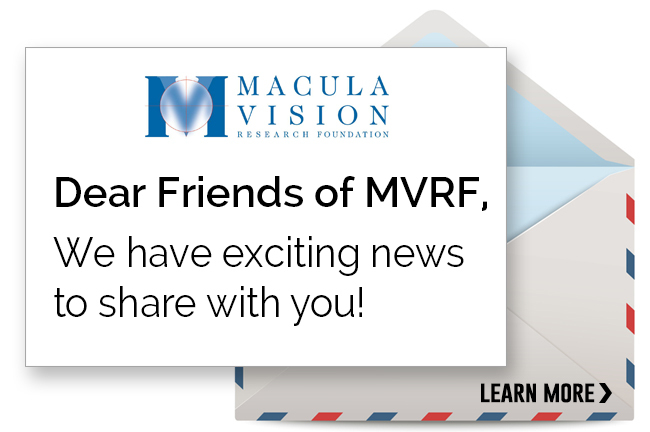 One research study at a time, MVRF is curing blindness! This study, solely funded by MVRF, demonstrates the effectiveness of gene therapy in treating Leber’s Congenital Amaurosis (LCA), a form of childhood blindness. This ground-breaking study fast-tracks continuing research for ALL retinal diseases, including macular degeneration. This Israeli study was initiated in the United States and the United Kingdom. Hear more about the success of the treatment in the video below! Click here to read the official press release. Stem cells are Nature’s own renewable resource – they have the remarkable property of creating more stem cells, a process termed self-renewal. This means that starting with just a few cells, large numbers of new stem cells can be created by cell division. As well as self-renewing, stem cells can also generate cells of the body, including retinal cells. By guiding this process carefully, researchers have figured out how to coax stem cells to produce the cells that are lost in macular degeneration, both retinal pigment epithelial (RPE) cells and light-responsive photoreceptor cells, and do so in quantities sufficient for transplantation. These stem cell derived products are now entering the clinical pipeline as transplantable therapeutics for macular disease. Human pluripotent stem cells were first described in 1998. These early embryonic stem cells are called ‘pluripotent’ because they can generate all cell types in the body – liver, heart, brain retina etc. Then in 2007 a new pluripotent stem cell type was created. Shinya Yamanaka found that a small skin biopsy, with the addition of 4 genes, can produce stem cells that also generate all cell types of the body. These ‘induced pluripotent stem cells’, or iPSCs, are an amazing invention that has led to an explosion of research, earning Dr. Yamanaka the Nobel Prize in 2012. As pluripotent stem cells can produce all cell types in the body, the challenge in creating RPE and photoreceptor cells is to make sure that these are the only cells produced, and that there are no residual iPSCs or other unwanted cell types in the stem cell product. These challenges have been in large part overcome, leading to production of highly pure human retinal cells in research labs and clinical manufacturing facilities. 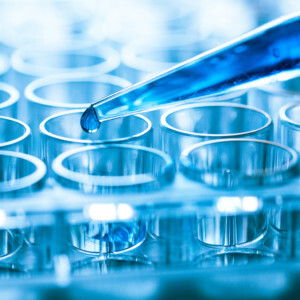 You may be asking yourself, where is there a clinical trial I can get involved in? Pioneering transplantation of human stem cell-derived RPE, US-based clinical trials, now sponsored by Astellas, aim to treat patients with Stargardts Disease and age-related macular degeneration (AMD). Early Phase I/II trials in which a small number of patients were transplanted with a suspension of RPE cells, indicated good safety. Now a larger number of patients will receive transplants to determine whether the cells work to slow or reverse vision loss i.e. whether they have efficacy, with Phase II results expected at the end of 2016. While Astellas is leading the pack, several other trials of stem cell-derived RPE cells are underway around the world. Cell Cure in Israel is using a similar approach to Astellas, and have an on-going Phase I/IIa trial that will complete this year. In the UK a different approach is being used by University College London – RPE cells are grown on a small patch of polyester that is then surgically implanted under the retina. A similar approach is being used by Regenerative Patch technologies in California. In Japan, the first iPSC-based clinical trial using a layer of RPE cells is also under way, led by Masayo Takahashi. And there are more trials coming. It is exciting that there are so many stem cell-based trials for macular disease, as we will learn a lot. Which works best, cell suspension or patch? What is the optimal dosage of RPE cells? Do patients need to be immunosuppressed so that the transplanted RPE cells survive long-term? We need to encourage the sponsors of these trials to be as transparent as possible with their results so that we can all learn from the generosity of patients willing to test these novel therapeutics. In advanced macular disease, RPE transplant alone will not be beneficial as the macula has lost the ability to respond to light with the degeneration of photoreceptor cells as well as RPE. Stem cell-derived photoreceptors can improve vision after transplantation into laboratory mice. When will this be ready for human trials? The challenge is greater than for RPE transplantation, as the new photoreceptors have to find their correct location in the retina and connect properly with other retinal cells. But if it can work in mice, there is hope that it will work in humans, and photoreceptor transplantation trials are likely to begin over the next few years. The progress of research and translation into the clinic, from the discovery of human pluripotent stem cells to clinical trials, is amazing. Transplantation of stem cell derived retinal cells could reverse the course of macular disease. Still, it does involve a transplant surgery and immunosuppression, which should not be taken lightly. Is there another way? In our lab at the Neural Stem Cell Institute, we have discovered that the adult human retina contains a stem cell that is geared to make new RPE cells. We have discovered factors that activate this unique cell in the culture dish and in mice. Our goal now is to activate the RPE stem cells safely in the human eye, so that the macula can self-repair. This could mean that in the future, we could stimulate endogenous repair by giving a simple injection, and avoid surgery and immune suppression. We thank MVRF for their generous support of our work! 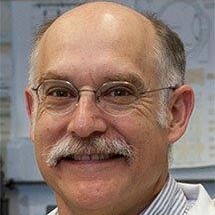 Dr. Temple’s research at the Neural Stem Cell Institute is currently being funded by an MVRF grant. The funding provided by MVRF was indeed instrumental in helping us develop both gene therapy and drug therapy approaches to for dry AMD. The Macula Vision Research Foundation (MVRF) has funded my project Using a Mouse Model of RPE Oxidative Stress to Understand Atrophic AMD. AMD is a disease of the retina, which is the part of the eye that captures light and converts it to neural impulses sent to the brain. The retina of the mouse is very similar to that of humans, and we hope that we can learn about the damage that occurs to a certain retinal cell type called the retinal pigment epithelium, so that we can prevent this damage in people. Behavioral risk factors, such as cigarette smoking and a low ω-3 fatty acid diet, suggest that toxic effects of oxygen contribute to age related macular degeneration. The Age-Related Eye Disease Study (AREDS) confirmed this connection. Therefore, we have used genetic manipulations to eliminate one of the enzymes that protect the retinal pigment epithelium from the damaging effects of oxygen. What we have found so far is encouraging. As in humans with AMD, mice with the missing enzyme suffer damage to the retinal pigment epithelium and build up fluorescent material called lipofuscin. This leads to deposits in the mouse that appear like drusen, the spots seen the retinal photos of people with dry AMD. Eventually, the damage to the retinal pigment epithelium leads to the death of photoreceptors, the light-harvesting cells of the retina. This process resembles geographic atrophy, a late stage of dry AMD in humans. So what is hopeful about damaging the retina of a mouse? This model has enabled us to study both drug therapy and gene therapy to treat the dry form of AMD. One drug we have tested has significantly reduced the accumulation of lipofuscin in the mice and preserved the function of their photoreceptor cells. We have also tested delivery of one gene that promotes the anti-oxidant defenses of the retina, and this has also preserved vision in the mice. I am enthusiastic about the gene therapy approach, because unlike current treatments for wet AMD, patients would need only one injection to arrest the disease. Funding from MVRF has kick-started this project. Most of my research has been centered on another blinding disease, retinitis pigmentosa, and it is difficult to get started in a new area of research, even in a related area such as age related macular degeneration, without credentials. MVRF support has allowed us to collect the preliminary data needed for publications and for recent successful grant applications to the National Institutes of Health and the Florida Department of Health. Without the assistance of the MVRF, we would have stalled. Almost as important as the MVRF funding, has been my participation in Macula Vision Research Foundation scientific conference. This has provided access to the latest developments in AMD research and has provided me with advice and constructive criticism from experts in the field. This exposure has been invaluable.